I took your advice! I ripped back, added a repeat, and then started the decreases a second time. And then? 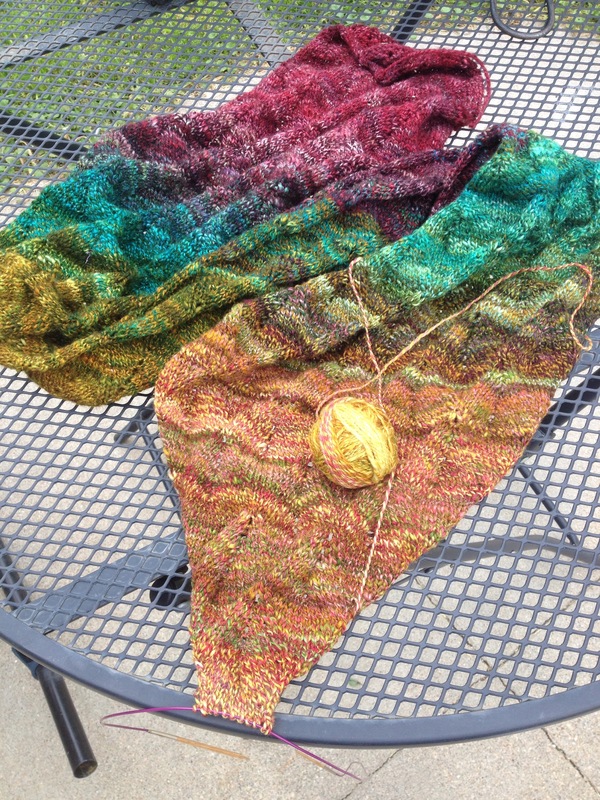 It looked like I could get another repeat, so I ripped out again, added another repeat, and then finished the shawl. There’s no way I could have added a third extra repeat. And am I glad I did? Am I ever! Do you see all that extra lovely gold color? That’s the kind of thing that really trips my trigger. 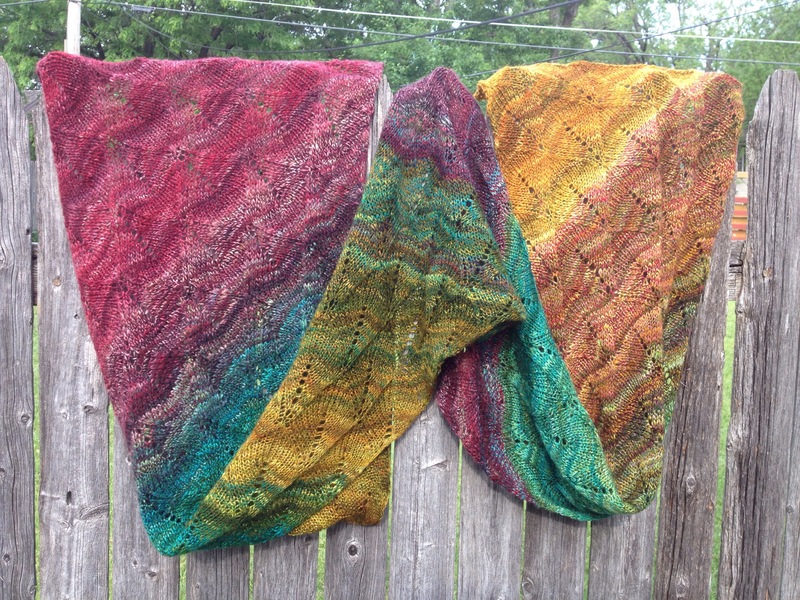 A really stunning scarf for just a little extra work. Yesterday I helped a friend pack up a moving truck to move to Washington. It felt like a good idea to pay back all the wonderful help we received during our move. 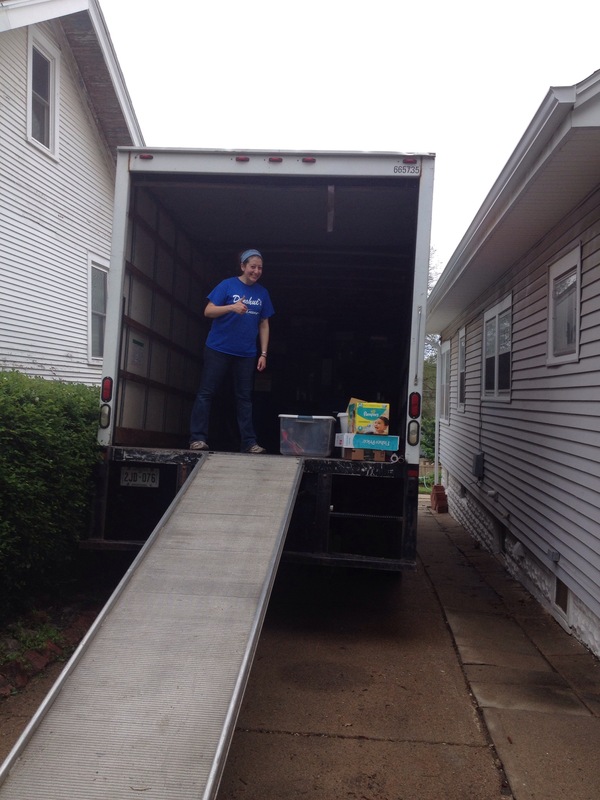 I’ve also just always really enjoyed helping people move. It’s a time when I can get a little extra workout while doing something that is extremely highly appreciated. The truck we loaded, early on in the process. Miss Bug was actually very helpful. She stayed at the edge of the truck, and pushed boxes to the back where they could be stacked easily. It’s nice to have a kid of an age where she’s hardworking and helpful! In order to make room for veggies and herbs. Well, I just didn’t want him to get the pleasure of choosing what to get at the store, so I went along and picked up some veggie plants. We then got home, Mr. Ink started preparing dinner, I yawned, and said “I just have no idea why I am so tired!” And Mr. Ink says “It’s because you NEVER SIT DOWN!” He then told me to GO sit down and he’d cook dinner. So I went outside and picked a nice big bouquet of flowers, and spent the rest of the time dinner was being made straightening the house for our big party this weekend. Naturally. I did get forced into sitting for a bit later on in the evening when my problematic heel got so bad I could barely walk. A little ice, a little rest, some seriously supportive shoes, and I am ready for an evening of work today. I’ve still been getting some time in on Nahant here and there. I’ll take time to work on it in the mornings before work, and then it also goes with me TO work and I’ll work on it while I am on my lunch break. When you last saw it, I was in a gold/green section but headed toward red. Now I am firmly back into the red section, and I can see some more blue/green on the other side of that. I probably won’t work on it much tonight, instead I’ll be vacuuming floors and doing laundry. And I couldn’t be happier about it! When you last saw this scarf, it was just headed into the gold section. Since then, I’ve made some pretty decent progress. I am still in gold, technically, but moving back into a greener tone. Plus, on this last purl row I started to see little bits of red, so I know that’s coming right up too. The colors got pretty muddy in this section, but the overall effect is still quite pleasing to me. That’s about it from here! Hope you are having a great week! I am starting to think that weekends just mean more hard work. I guess it’s been that way for months on end now, so why would I think differently at this point? We spent the weekend cleaning, hanging art, shopping, assembling, repairing, and on and on. The house looks beautiful, but we are getting tired. And, a little bit resigned. And then, this morning I woke up and walked out into my pristine living area with the art up on the walls and realized that It. Is. Worth. It. 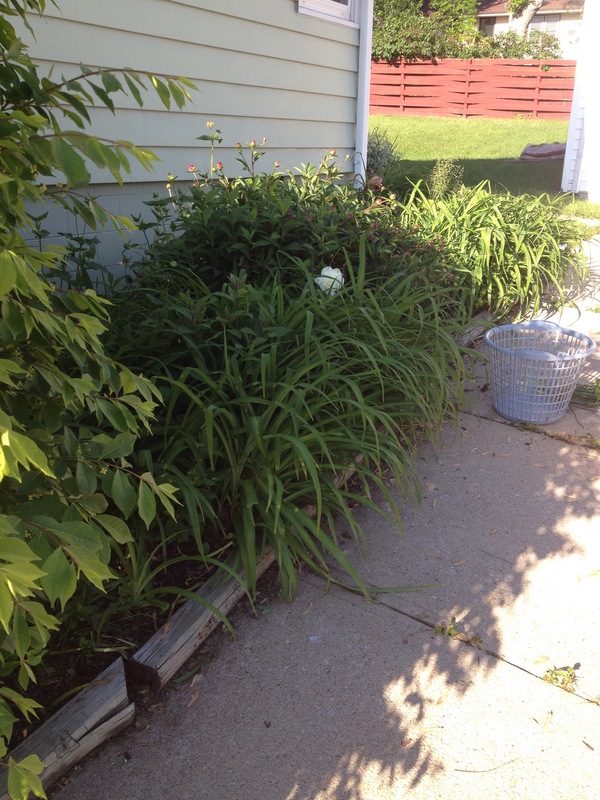 In fact, I can’t wait to get home this evening, despite the fact that we’ve got a full evening of yardwork planned, SIMPLY Because I know getting home to a beautiful space really does make me a more relaxed person, even if it does take a little bit of energy to get there. 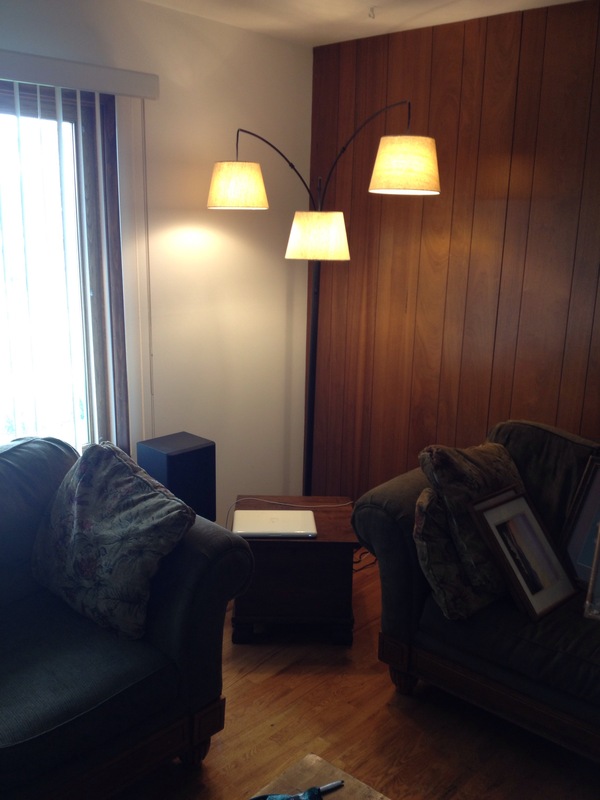 One of the items we purchased this weekend was a large floor lamp. Our living area is very large, and very retro. We’ve had some struggles with lighting in there. Mr. Ink and I went shopping for a floor lamp, and ended up with the biggest, tallest lamp we could find. Once put together, it fit the space so perfectly we realized that a really huge lamp was exactly what that space needed. As a bonus, we also purchased a matching lamp shade for a regular table lamp we already had. That tied everything in well together. I also made a mother’s day dinner for Mr. Ink’s mom, and we had her over to see the house. That was quite pleasant, and while Mr. Ink is the real chef in the family, I was cooking for her specific needs, and I really hit that dinner out of the part, if I do say so myself. Really delicious comfort food was had by all. 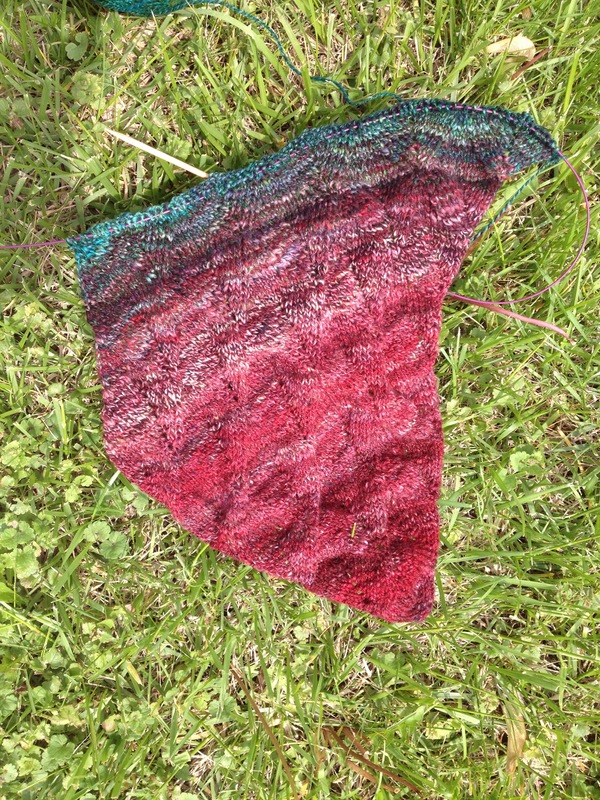 And, as usual, I did manage to cobble together some bits of time to work on some knitting. 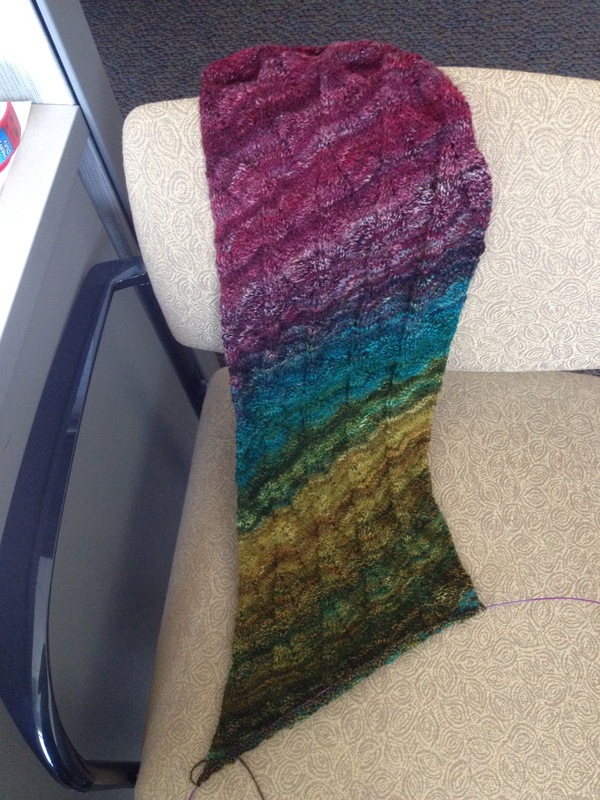 My Nahant scarf is coming along quite well, I’ve worked through the first teal bit, and into some gold. 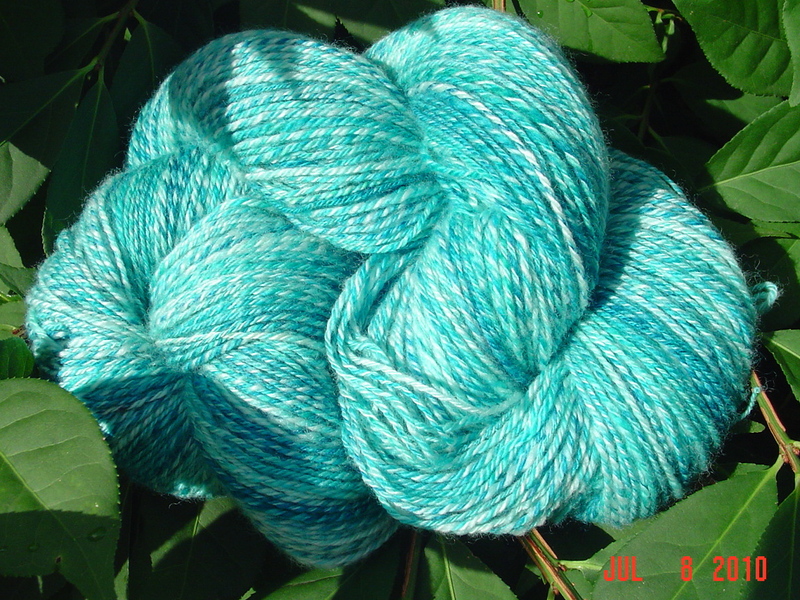 Looks like we’ll get teal again right after the gold, from what is peaking through the ball of yarn I have for this. That gold color is one of my absolute favorites, so I am looking forward to this section quite a bit! 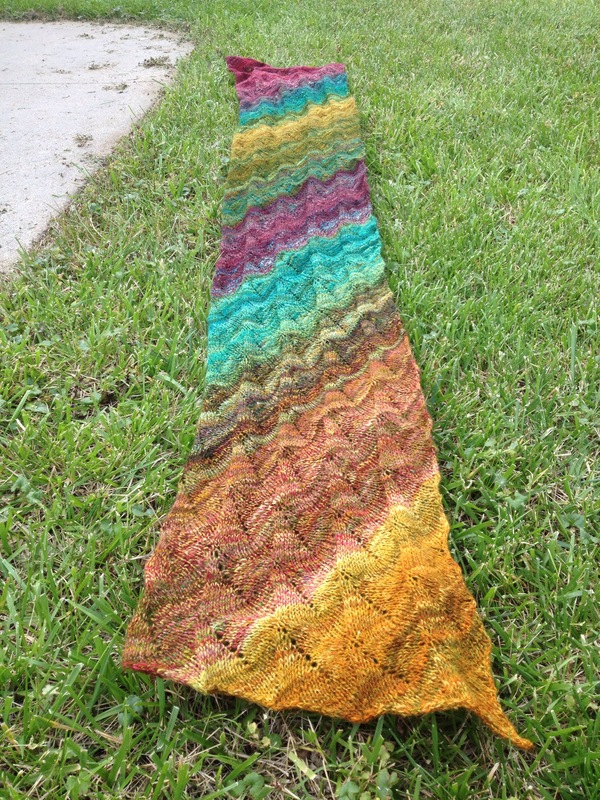 I finished my handspun baktus scarf last evening. I’d actually been done, but I decided to use the small remaining ball of yarn for some fringe on the ends. I had time to make that happen last evening, so I set out to take pictures of the scarf. Now, being that it’s a new place, I really haven’t scoped it out for great places to take photos. As I was wandering around the house looking for a place, Mr. Ink came home from work. I greeted him, then continued on my quest to find an appropriate place to photograph the scarf. I settled on a fence in the yard. the top of it is rather weathered, and since it was a very windy day, and we are at the top of a hill, the weathered top of the fence actually held on to the scarf. So I quickly grabbed a picture. And got photobombed in the process. I actually love this photo. Because it’s so alive. 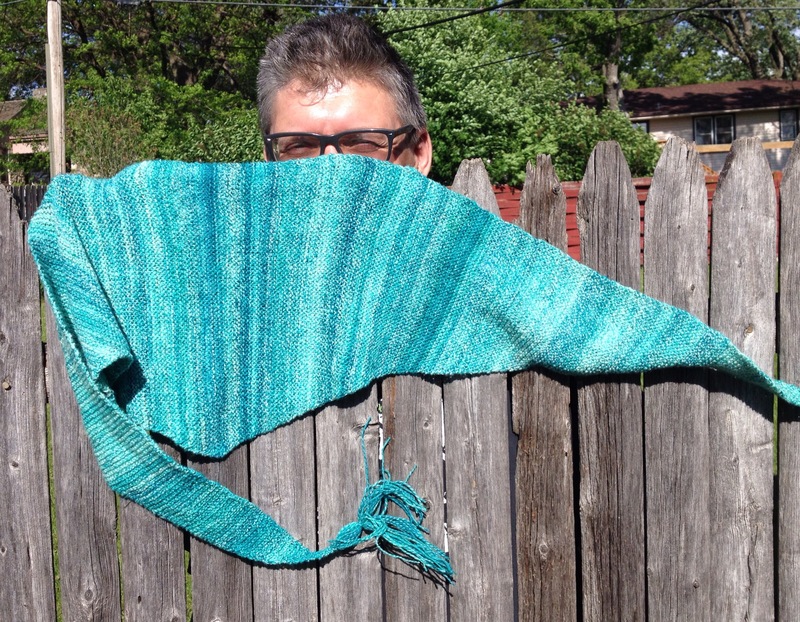 If knitwear could snap in the wind, the ends of this scarf would be. And the mischievous look in Mr. Ink’s eyes is also caught by the camera. It sort of sums up what life has been like ever since we moved into the new place. Wild, crazy, fun. As for the scarf itself. It’s handspun I’ve had in my stash for ages. The original fiber was Crown Mountain Farms, and it was only half of their regular 8oz. bump. The baktus scarf serves it very well, I love how it stripes but stays teal. 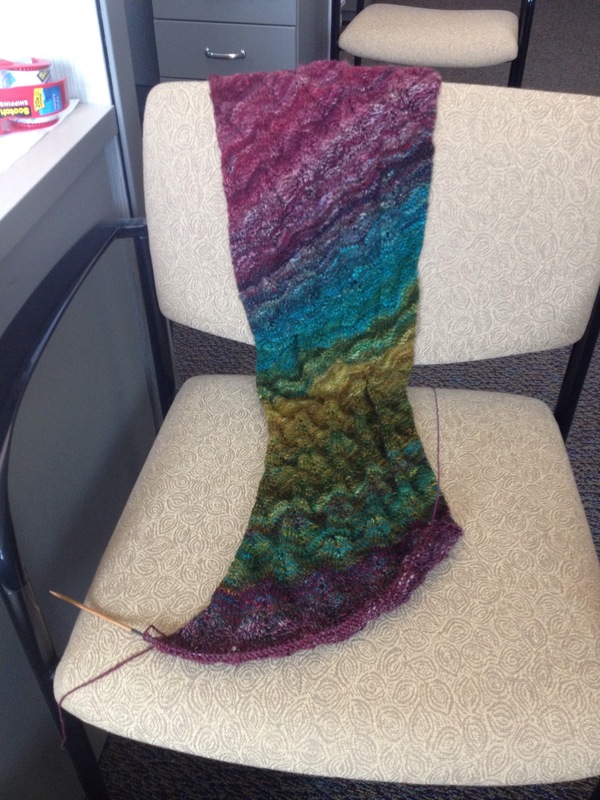 I also managed to finish the increases on my new Nahant scarf. 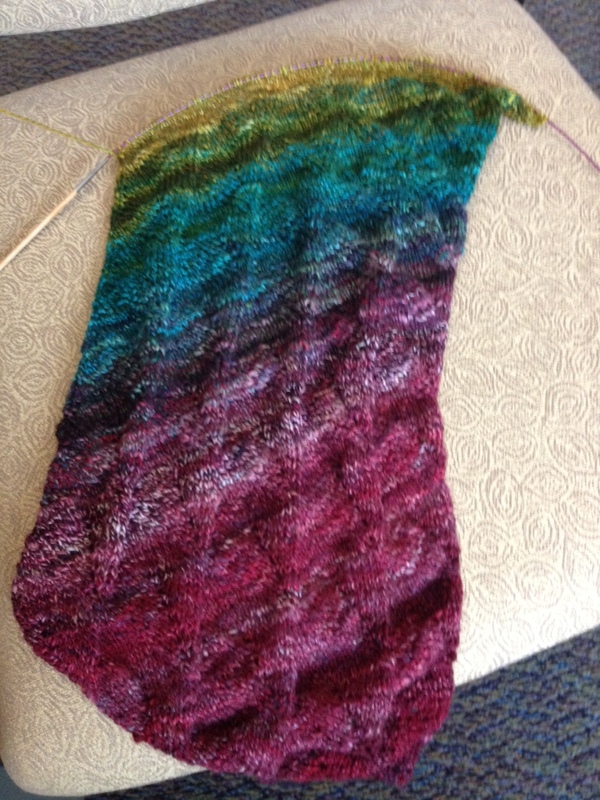 I am still knitting red but I can see a color change coming up, and even the red has some striping to it. I’ll take a picture for tomorrow. I am very excited about that project!